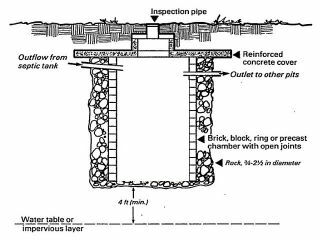 This document explains what a drywell or seepage pit is, gives safety and maintenance advice for drywells / seepage pits, and defines the criteria for drywell failure. We also explain a useful difference between a drywell (accepts only graywater) and a seepage pit (accepts septic effluent). We warn readers that while installation of a drywell to receive graywater at a property may be a good idea, the use of drywells may be a warning about the capacity and remaining life of the septic system. This article series explains septic system and drywell or seepage pit or cesspool inspection procedures, defects in onsite waste disposal systems, septic tank problems, septic drainfield problems, checklists of system components and things to ask. Drywell & seepage pit maintenance and pumping schedules. Seepage pit design specifications: this article discusses the design & construction of septic seepage pits for septic wastewater treatment to perform the functions of septic effluent treatment and disposal in onsite wastewater treatment systems, conventionally called "septic systems". A seepage pit is designed to receive clarified effluent from a septic tank, or if the pit receives only gray water (GREYWATER SYSTEMS) then it's called a drywell. Seepage pits: a "seepage pit" may be used as a septic effluent absorption system such as shown in the sketch at the top of the page and also immediately above. In this application, instead of receiving only graywater from sinks, laundry, shower, etc., the seepage pit is receiving not just graywater but also blackwater-effluent or septic effluent which flows out of a septic tank. Unlike the drywell described just above, in this design waste, including black water and gray water, leaves the building through a main drain which enters a septic tank. The tank retains solids and grease/floating scum, allowing clarified effluent to enter the seepage pit for disposal into the soil. Cesspool: a hole in the ground, lined with site built or manufactured perforated sides / bottom that receives raw sewge, blackwater, including solids and liquids, allowing effluent to seep out of the cesspool into surrounding soils. There is no separate effluent disposal system. Seepage pit: a hole in the ground, lined with site built or manufactured perforated sides / bottom that receives liquids only (i.e. not a cesspool). In our usage, a seepage pit receives septic effluent from a separate septic tank, while a drywell receives graywater or other non-septic drainage waters directly from their source. We perfer to distinguish between these two applications because depending on how a seepage pit is being used, its design, capacity, life and maintenance may be different. 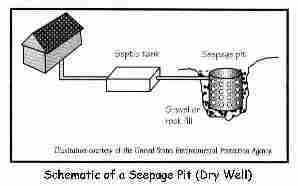 But many other texts use the terms drywell and seepage pit as synonyms. Seepage pits come in a variety of capacities, sizes, shapes, and can be safe (against collapse) when a modern factory-built unit is shown, such as those in this photo. Watch out: We do not consider the use of traditional seepage pits a complete and satisfactory onsite septic effluent wastewater disposal system design, though where space is limited or for other problem site reasons it may have been the choice of the septic system installer. Disposal of septic effluent deep below ground in a seepage pit (typically four to six feet deep and placed another two or more feet below grade level) means that little or no aerobic bacteria will be present. Limiting the bacterial action to anaerobic may mean that the biomat that forms around the seepage pit will not adequately treat the effluent. The system may then be discharging contaminants into groundwater and the environment. Fortunately there are alternative onsite wastewater disposal alternative designs which can handle limited or even zero-space sites, so a simple seepage pit as a destination for blackwater effluent is no longer the only choice for limited-space sites. 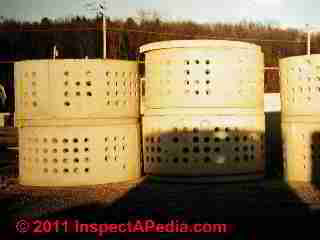 (h) Seepage Pits used for septic system effluent disposal in "New York State Septic System Design Regulations 75-A.8 Subsurface treatment - disposal of septic effluent - design specifications for septic systems" includes design specifications for seepage pits used to receive septic effluent, including tables of dimensions required for different household loads. Watch out: Safety Warning: do not walk over the top of or close to the edges of a drywell or any other onsite pit or excavation because of the danger of fatal collapse. Keep pets and children away from such systems. Watch out: Safety Warning: there is a risk of drywell collapse, risking injury and potential fatality if someone falls in to one of these systems, particularly for older site-built systems that were often made of dry-stacked stone or concrete block, and more-so if such systems are not protected by a very secure cover. Believe it or not, simple wood board covers were often used on home-made drywells. Such covers rot and ultimately collapse. Watch out: Readers trying to diagnose and deal with sudden soil subsidence or yard collapses should see CESSPOOL SAFETY WARNINGS as those hazards can also apply to drywells and septic tanks, and also see SINKHOLES, WARNING SIGNS. Additional septic system safety warnings are at SEPTIC & CESSPOOL SAFETY. Limited septic system capacity implied by the presence of a seepage pit. Wet soil conditions or limited space for a functioning drain field (for the septic system) often leads property owners to reduce the liquid load on the septic system by routing gray water to a separate drywell. Where such a system is installed owners/buyers should be alert for these conditions and should expect to face extra costs for system maintenance and repair as well as limited septic system capacity. An exception to the septic system capacity warning above at a large building where a sink or laundry are added in an area distant from piping connected to the septic system, an owner may add a remote drywell as an alternative to inconvenient and costly routing of a drain line from the laundry to the existing septic system. Septic system test warning: the use of seepage pits (or drywells) can obscure or prevent effective septic loading and dye testing: If a drywell system is installed, running water at the fixtures draining into this system (as may be done by some septic tests) are likely to fail to perform a loading test on the septic system even if such a test was attempted. First, the fixtures where water was run in attempt to test the septic system (tank and leach field) may not even be delivering water to those components if instead the fixtures drain to a separate drywell. It is critical to trace building drains as part of a septic test or to otherwise try to determine if the test water is actually entering the septic system. Even if we're trying to "test the drywell or seepage pit", if the seepage pit is "working" at all, it is a large, mostly empty hole in the ground. After a period of disuse it may appear to be working during a test because the "test" is simply filling up the empty hole in the ground. But if soils around the seepage pit (or drywell for that matter) have become clogged, the system will fail in a day or two of ordinary use as the no-longer functioning hole is filled with wastewater. Where a drywell or seepage pit is installed at a property and a septic inspection was attempted, more testing may be in order: in cases where only toilets empty into the septic system, it may be possible to make a more effective septic loading and dye test: put a test water load directly into the toilet by using a garden hose. This is not a typical/normal septic test procedure and has its own concerns such as overloading a system of unknown design that did not anticipate such volumes and possible back-contamination of water supply via hose in toilet (a cross connection). Whether or not such an additional test is performed, our warning about a system of limited capacity for which the owner may face significant costs to repair or expand capacity remains in effect. Some experts recommend installing a filter on water entering the seepage pit. Particularly for a seepage pit used to receive water not just from a septic tank receiving black water but also graywater from a clothes washing machine, installing a lint filter between the washing machine and the seepage pit can extend the life of the drywell by reducing the moment of soil-clogging particles of lint and debris into the system. Intermittent dosing systems such as are used for some alternative septic system designs, can also be adapted to graywater systems. In simple terms, this means that multiple drywells are used, and graywater is routed intermittently among them, giving the unused drywell time to recover. A simple valve system on the graywater drain line can serve to route greywater (graywater) to alternating drywells. Cesspools gives more in-depth information about those systems. Repeating an important distinction we made above, a cesspool is not a seepage pit, and vice versa, though their construction may be similar. Cesspools receive black water (sewage including solids) directly. Seepage pits receive only clarified septic effluent ( no large solids). [DF NOTE: the term drywell might be used for a seepage pit disposing of septic effluent in this case; by contrast, a cesspool holds both solid waste and septic effluent. I use the term "seepage pit" to refer to a pit used to dispose of septic effluent which originated as blackwater, the solids having been retained in the septic tank. I use the term "drywell" to refer to a pit used to dispose of graywater (greywater) which originated in sinks, laundry facilities, or showers. While their uses and implications of their presence at a property are quite different, the actual construction details of a seepage pit or a drywell are about the same. DRYWELL DESIGN & USES (our main page on this topic) for more in-depth information about seepage pit and drywell systems. Seepage pits and drywells are discussed in greater depth and are contrasted with cesspools at DRYWELLS for onsite wastewater disposal or onsite gray water disposal - What are Drywells, What Drywell Maintenance is Needed? How do Drywells Fail? Cesspools for more in-depth information about those systems. (i) If soil and site conditions are adequate for absorption trenches, seepage pits shall not be used. (ii) A minimum three foot vertical separation must exist between the bottom of any pit and the high groundwater level, bedrock, or other impervious layer. 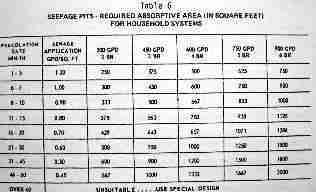 (i) The required "effective seepage pit area" is obtained from Tables 6 and 7 which are shown below. (ii) No allowance for infiltration area is made for the bottom area of a pit or the surface area of impervious soil layers (percolation rate slower than 60 minutes/inch). (iii) The effective diameter of a pit includes the diameter of the lining plus the added diameter provided by the annular ring of aggregate. Any area surrounding the liner with rock smaller than 2 1/2 inches in size shall not be included as part of the effective diameter. (iv) Effective depth is measured from the invert of the seepage pit inlet to the floor of the pit, with the thickness of impervious layers deducted. 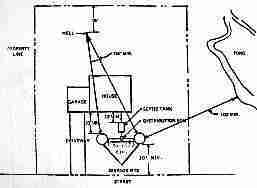 This sketch (from New York's Wastewater Regulations) shows the recommended site clearances between a seepage pit (or cesspool or drywell) and other building and site features. A more detailed list of site clearances to septic system components is listed at "More Reading" just below. Notice that seepage pits not only need to be at a sufficient distance from the building, from wells, from property lines, but also if multiple seepage pits are installed, they should be adequately separated from one another. Clearances for Septic Components Required - Well distance to Septic, Septic clearance from well, trees, lakes, streams, property boundary, etc. Table 6 shown here gives the required soil absorption area for seepage pits as a function of soil percolation rate and anticipated daily wastewater flow in gallons. Table 7 given below shows the size of seepage pit necessary in order to provide the required soil absorption area for seepage pits. 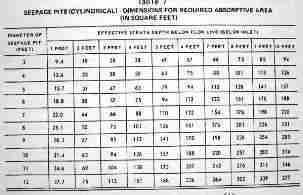 First use the preceding table to determine the necessary seepage pit absorption area, then use this table (below) to determine the necessary seepage pit size to provide that absorption area. 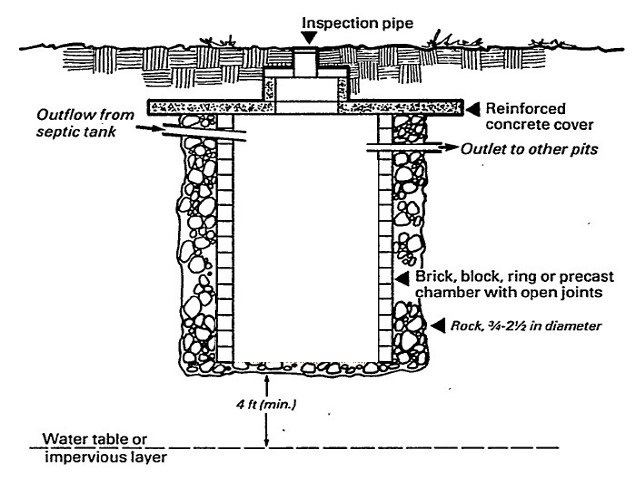 The schematic of a seepage pit (left, courtesy USDA) shows typical construction of a site built seepage pit using brick, block, or pre-cast concrete rings with open joints, surrounded by stone to improve soil absorption. NYS: (v) Seepage pit linings may be pre cast concrete, cast-in-place concrete, or built in place with unmortared hollow cinder or concrete blocks. Concrete shall have a minimum compressive strength of 2,500 psi and 3,000 psi is recommended. Material with comparable structural strength, determined in accordance with commonly accepted sewage construction standards, principles or practices, may be allowed on an individual basis to prevent unreasonable hardship, provided public health is not prejudiced. (vi) The separation between the outside edges of seepage pits shall be three times the effective diameter of the largest pit. This separation is measured as the undisturbed soil between pit excavations. (vii) Pits shall be designed with sufficient structural stability to withstand lateral soil forces as well as vertical loads. (i) Laterals leading to each seepage pit must be at least four inches in diameter with a minimum slope of 1/8 inch per foot. (ii) Seepage pits shall not be connected in series. A distribution box shall be required where more than one seepage pit is installed. (iii) The pit excavation is to be raked to minimize sidewall smearing that may occur and reduce infiltration capacity. If groundwater is encountered, the pit shall be backfilled with the original soil to a level at least three feet higher than maximum groundwater and adjustments made in the pit dimensions. (iv) The linings are placed upon a concrete block, poured concrete, or pre cast footing and surrounded by a six inch minimum annular ring of large aggregate (2 1/12 - 4 inches in size). (v) The rock is covered to prevent soil from filling the void spaces. Building paper, a four inch thick layer of hay or straw may be used. (vi) The seepage pit cover shall be structurally sound and capable of supporting 300 pounds per square foot at the weakest point. Covers may be pre cast concrete or cast-in-place and shall be reinforced. A manhole with an opening of at least 20 inches in the shortest dimension shall be provided. 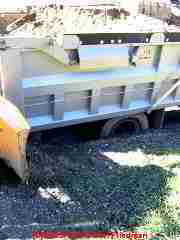 A seepage pit, drywell, or cesspool can be collapsed as shown in this photo, where a seepage pit receiving septic effluent was driven over by a heavy dump truck. Watch out: Seepage pit, cesspool, or drywell collapses are dangerous and can be fatal if someone falls into the collapsing opening. Falling into a cesspool, seepage pit, or drywell can easily be fatal, and quickly. We investigated a tragic case in which an adult fell into a cesspool that then collapsed over him, burying him alive. In general, while there are heavy duty septic system components and covers for pits and tanks, you should not permit traffic to drive over septic equipment nor on septic fields. See SEPTIC & CESSPOOL SAFETY. Reader Question: What product can I by that will eat the grit and dirt off the walls of the seepage pit, clean the pores so that the liquids will drain out in the earth, and so that I do not have to pump out all the time? I live in the Hollywood Hills CA. I have a septic tank inlet and outlet and a seepage pit. My seepage pit & septic I have to have to pump out every 4 months versus 2 years, for the liquids are not seeping out and the pores are clogged with grit, dirt and I would say toilet paper. What product can I by that will eat the grit and dirt off the walls of the seepage pit, clean the pores so that the liquids will drain out in the earth, and so that I do not have to pump out all the time? - S.B. A competent onsite inspection by an expert usually finds additional clues that help accurately diagnose a septic system or seepage pit problem. That said, we do not recommend septic seepage pit additives or cleaners for septic effluent seepage pits (see SEPTIC TREATMENTS & CHEMICALS) - using at least some of these products risks contamination of your environment, groundwater, or nearby wells, and depending on local laws septic treatment chemicals may be illegal as well. Septic seepage pit rejuvenation methods like agitating or hydrojetting can sometimes temporarily give some relief and cause drainage at least from the bottom of the pit, but depending on how the seepage pit has been constructed these methods can be very dangerous. The risk is a pit collapse, someone can fall in - a fatality that has actually happened more than once. In sum if the seepage pit no longer drains into the surrounding soils, you need a new one. You can extend the connection to the new seepage pit from an outlet from the old seepage pit provided the old pit is not in danger of collapse. Otherwise the old pit needs to be abandoned: pumped out and filled-in with soil and rock to be safe. Your observation of toilet paper in the seepage pit suggests that solids are not being retained in the septic tank where they belong. If solids are flowing into the seepage pit from the septic tank, that will explain its short life and costly frequent pumping. The cause could be damaged or missing baffles in the septic tank - something that can be repaired when your new seepage pit is installed. Our photo (above-left) shows a damaged septic tank baffle that was allowing solid waste to flow out of the septic tank into the absorption system. 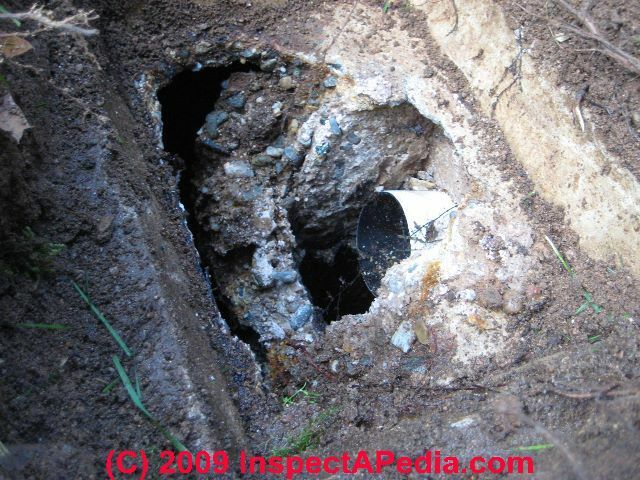 Details of septic tank tee replacement (baffle replacement) are at SEPTIC TANK TEES. When your new effluent seepage pit is being installed, look into installing a filter at the outlet from your septic tank; in fact check that the septic tank baffles are intact. Beyond their design specifications provided here, seepage pits & drywells are also discussed and are contrasted with cesspools at DRYWELL DESIGN & USES or onsite gray water disposal - What are Drywells, What Drywell Maintenance is Needed? How do Drywells Fail? A cesspool is not a seepage pit, and vice versa, though their construction may be similar. Cesspools receive black water (sewage) directly. DRYWELLS ARE THEY ACTUALLY DRY? Continue reading at DRYWELL / SEEPAGE PIT SPECIFICATIONS or select a topic from closely-related articles below, or see our complete INDEX to RELATED ARTICLES below. SEEPAGE PITS at InspectApedia.com - online encyclopedia of building & environmental inspection, testing, diagnosis, repair, & problem prevention advice. Unfortunately for your wallet, many municipalities won't allow ner / replacement seepage pits. It's because their depth excludes waste treating areobic bacteria from the process. In short, a seepage pit may dispose of liquid effluent but it it not adequately treating it. Instead it contaminates the environment. Your article says "Fortunately there are alternative onsite wastewater disposal alternative designs which can handle limited or even zero-space sites, so a simple seepage pit as a destination for blackwater effluent is no longer the only choice for limited-space sites." What alternatives? At the References section of most of the articles in this series there are citations such as work by Anish Jantrania who has described a completely above-ground wastewater treatment system. Since Anish wrote his text, several companies have begun advertising small wastewater treatment systems suitable for residential properties. Septic Tank/Soil-Absorption Systems: How to Operate & Maintain [ copy on file as /septic/Septic_Operation_USDA.pdf ] - , Equipment Tips, U.S. Department of Agriculture, 8271 1302, 7100 Engineering, 2300 Recreation, September 1982, web search 08/28/2010, original source: http://www.fs.fed.us/t-d/pubs/pdfimage/82711302.pdf. Table of Required Septic & Well Clearances: Distances Between Septic System & Wells, Streams, Trees, etc.